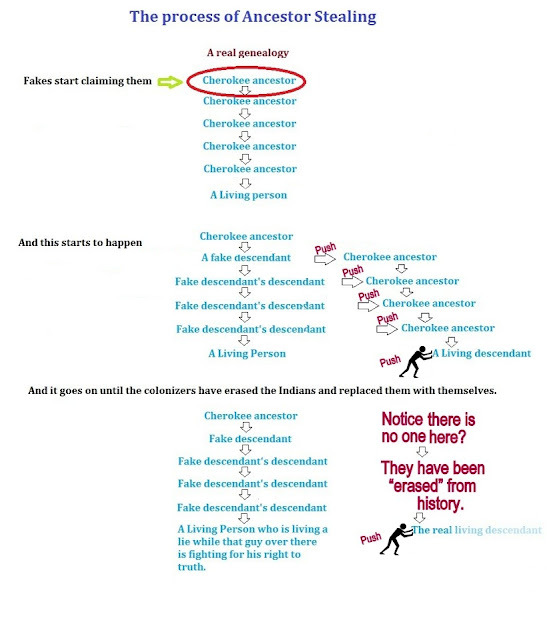 As I have said before, a trend I have noticed with those who falsely claim Cherokee ancestry is that of "ancestor stealing." This means someone lays claim to an ancestor that isn't theirs and then inserts that person into their family tree, building an entire genealogy around them. I would like to discuss this topic again because, due to an 1896 application, one family has stolen an ancestor. In this case, I don't believe the theft was intentional, but instead a case of not doing an exhaustive search of all the documents available to properly identify the ancestor claimed, as well as not resolving the conflicting information available. Had they done these two things, it is very unlikely they would have wrongly claimed this well documented Cherokee as their ancestor. But more on that later. First, I want to show what happens when someone steals an ancestor from their rightful descendants. Do you see what happens? Slowly but surely, the fake descendants start to push the real descendants aside until they, at least in that genealogy and on paper, no longer exist. Notice this statement, "And it goes on until the colonizers have erased the Indians and replaced them with themselves." That is what happens. Indians are replaced with non-Indians. Historically that is what happened with our land. Indians were pushed aside and non-Indians took over. Now that we have no land left, non-Indians are trying to push us aside and take both our ancestors and our identity. This is why we find "ancestor stealing" offensive. We are still here and we would like to hold on to the few things we have left! I have already said, I don't think the family that "stole" the Cherokee ancestor did it intentionally, but despite that fact, they did it. They did not take the extra steps to make sure the person they claimed as their ancestor really was, so the harm is done and it has grown exponentially. Now over 50 trees exist on Ancestry.com with the same mistake. It concerns me that none of these supposed family genealogists have bothered to actually verify the information before copying it. Now there are many people who believe they are Cherokee when they aren't. Fortunately for the family of the stolen Cherokee, we have an abundance of records. Because of all those records, we can show that these "ancestor stealers" are wrong and we can reclaim this ancestor and restore her to her rightful place in her family tree while preventing the new intruders from trying to take what belongs to her descendants. Stay tuned for more on one family's mistake based on an 1896 application, how the real descendants feel about it, and how the truth is easily found when looking at all the records available on the ancestor claimed.